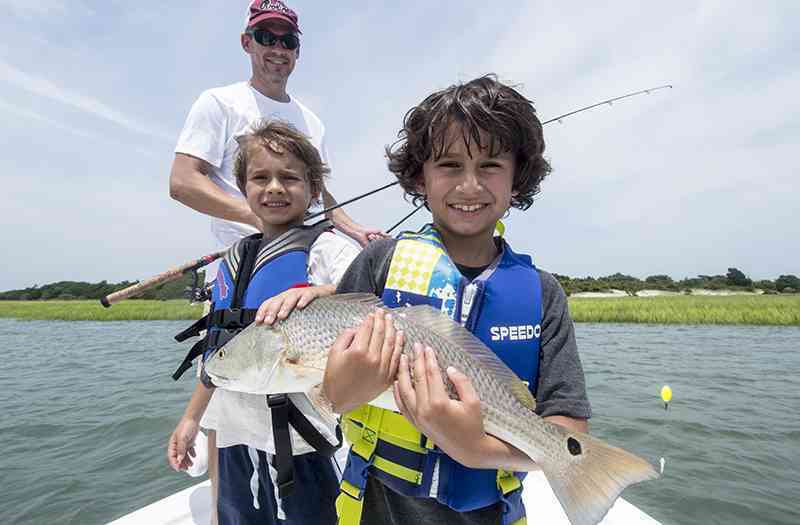 Red Drum (also known as Redfish, Spottail Bass, or Channel Bass) are the most abundant of all inshore game fish species here in Myrtle Beach. Due to their abundance year around and overall fighting ability, Red Drum are the most popular game fish and is the primary target for many of our fishing charters. We primarily target Red Drum using light spinning tackle and fly fishing equipment, however when targeting the breeding size Red Drum(35-50in) we’ll step up our gear to handle these mighty fish so that they can be released healthy. Where do we fish for Red Drum? We target “Redfish” is a variety of different areas using a wide range of techniques but generally we are fishing in shallow water less than 5ft deep. Fly Fishing for Redfish is very popular since they can be found in many shallow water areas where we can sight fish to them. Using conventional spinning gear, we will generally target them in shallow creeks and bays, around structure and oyster rakes. The shallow water variety average between 2-8lbs, while the deeper water Redfish average 15-30lbs. The majority of Redfish trips depart just 20 miles south of Myrtle Beach from Georgetown where we have nearly 60 miles of undeveloped coastline to fish. 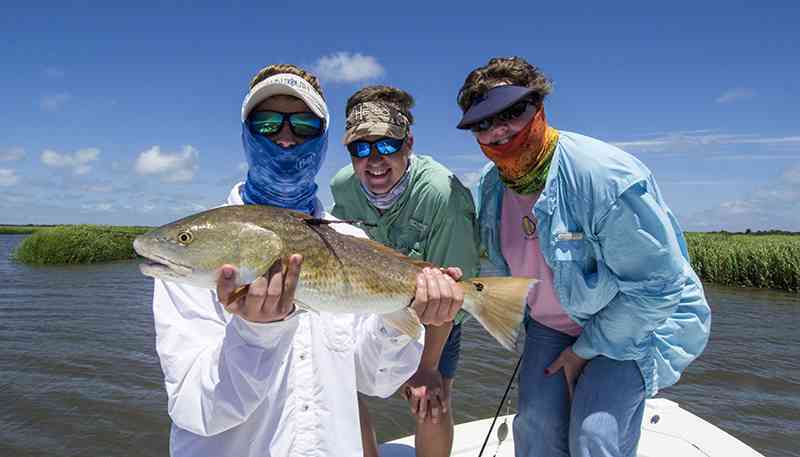 We also offer surf fishing charters to remote barrier islands where large Redfish congregate during spawning events. When do we fish for Red Drum? We target Redfish year around here in Myrtle Beach. In Winter, large schools of redfish can be found often in water less than a foot deep. Spring and Summer are also excellent times of year to fish for redfish, while Fall is perhaps the best time to target redfish. For the deeper water variety(locally known as Channel Bass), the Fall spawning period kicks off in September and will last thru early November. We also have a smaller spawning event in the Spring and early Summer. 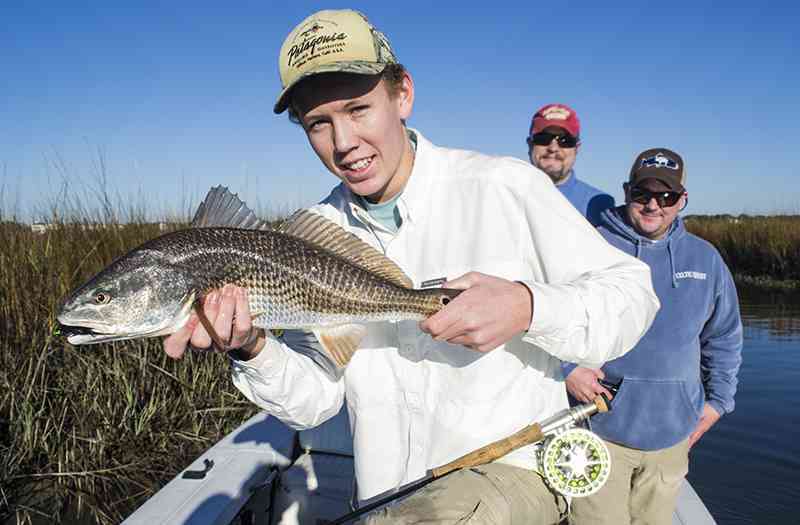 Redfish are popular for experienced anglers and novice anglers alike. The level of experience will dictate how we target redfish either using live bait, artificial lures, or fly fishing equipment. Capt. Jordan will provide instruction as needed and will accommodate even the most inexperienced anglers. Recently we have seen a decline in our local Redfish population here in Myrtle Beach and your captain strongly encourages catch and release for all Redfish. Tagging projects throughout the state have revealed that many Redfish have been caught multiple times(one particular fish was caught and released 12 different times). To ensure a healthy population of redfish for our future generations, we prefer to release these fish healthy and happy.